The Jurassic, second of three periods of the Mesozoic era, began 205 million years ago after a mass extinction event that saw the end of the Triassic. It was a time of significant global change in continental configurations, oceanographic patterns, and biological systems. During this period, the supercontinent Pangea split apart, allowing for the eventual development of what are now the central Atlantic ocean and the Gulf of Mexico. 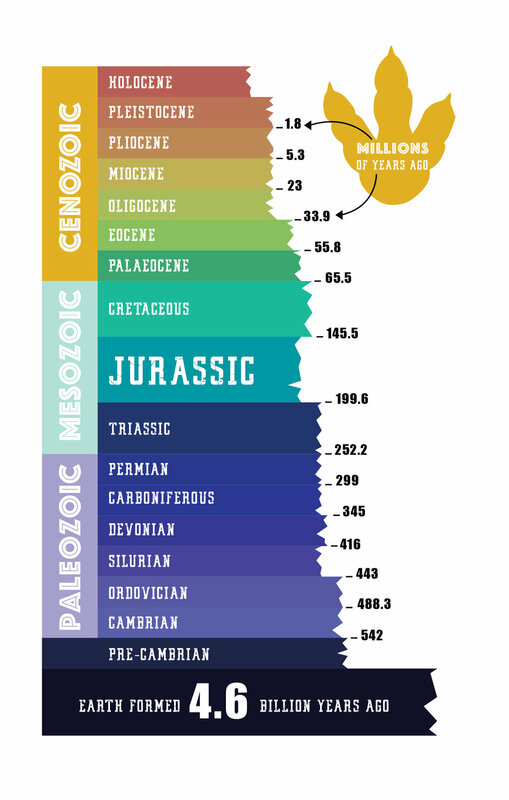 Although the Triassic-Jurassic extinction saw the disappearance of more than half of the known species on both land and in the ocean, the more temperate climate saw the Jurassic period become host to the most diverse range of organisms Earth had yet seen. Once dry deserts became green with ferns, cycads, horsetails and tall coniferous forests which, sustained the huge appetites of the herbivorous dinosaurs. While lush vegetation covered land, life in the ocean was rich and diverse, with thriving reef ecosystems and shallow water invertebrate communities. Spiral-shelled ammonites, squid and fish filled the ocean with life, and in response to this we saw the big oceanic carnivores flourish. Ok, so imagine a dolphin with huge eyes crossed with a lizard…you've just successfully imagined an ichthyosaur, which literally means, “fish lizard”. The early to middle Jurassic period (about 200 to 175 million years ago) was the golden age of the ichthyosaurs. Although it is important to remember these where reptiles not mammals nor fish, they did share many of the same behavioural and body features to those of modern day dolphins and bluefin tuna. Like dolphins, most ichthyosaurs are believed to have given birth to live young, rather than laying eggs like contemporary land-bound reptiles. They are recognisable by their streamlined bodies, large eyes, protruding snout, and solid ear-bones. Their oversized eyes provided detailed vision when navigating murky depths. This coupled with their massive and thick ear-bones, which allowed them to pick up subtle vibrations in the water, made them masters at pursuing fish and squid. The end of the Jurassic period saw the extinction of most ichthyosaurs, although one, platypterygius, survived into the Cretaceous period. This was most likely due to the evolution of the speedier and better adapted marine reptiles like the plesiosaurs and mosasaurs. Plesiosaurs (PLEE-SEE-oh-SORE-us), greek for “almost lizards,” were large, long-necked, four-flippered marine reptiles that paddled their way through the oceans, lakes, rivers, and swamps of the Jurassic and Cretaceous periods. They were relatively slow swimmers, therefore it is likely that they cruised slowly below the surface of the water, using their long flexible neck to move their head into position to snap up unwary fish or cephalopods. Pliosaurs (PLY-oh-SORE-us) were a type of short-necked plesiosaur. These spiked-teethed badboys lurked the seas during the middle Jurassic and, unlike the plesiosaur, where built for speed. Their massive mouths were lined with foot-long triangular teeth which could crunch down on their prey such as squid. Long-necked plesiosaurs with a biting force estimated to be several times that of Tyrannosaurus. People known as cryptozoologists have speculated about whether all the plesiosaurs and pliosaurs really went extinct 65 million years ago along with their dinosaur cousins. 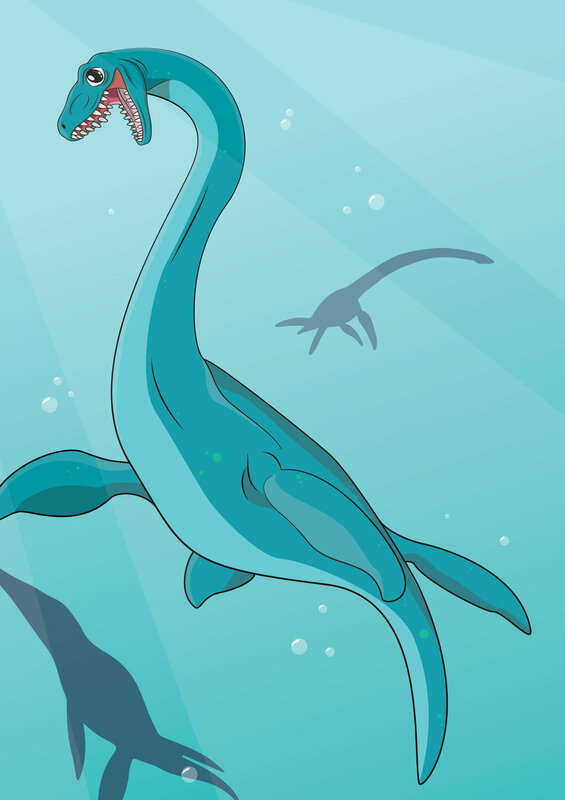 Whereas any surviving terrestrial dinosaurs would likely have been discovered by now, the reasoning goes, the oceans are vast, dark and deep--so somewhere, somehow, a colony of Plesiosaurus might have survived! Pretty cool, right? At close to 50 feet long and up to three tonnes, the Elasmosaurus was one of the biggest plesiosaurs of the Mesozoic Era. Elasmosaurus had the longest neck of any plesiosaur yet identified, about half the length of its entire body and supported by a whopping 71 vertebrae! Elasmosaurs, although beautifully adapted to aquatic life, were still reptiles, and thus had lungs rather than gills, meaning they had to surface to breath. Despite many depictions showing this majestic reptile holding it's neck elegantly out of the water, palaeontologists have concluded that, given the enormous size and weight of its neck, Elasmosaurus was incapable of holding anything more than its tiny head above the water. It is easy to forget the sheer age, extensive changes and vast biodiversity this planet as seen. The ocean, still to this day, remains a place of wonder and mystery. Let us always marvel at this ineffable body of saline water, whose presence dictates and maintains life on this planet.